Each summer, we invite young readers to explore a well-crafted novel, play around in its pages, and develop creative work in response to what we read. 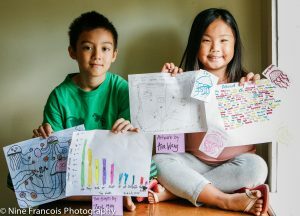 The Book Crush fosters close reading skills, creative reading approaches, critical thinking, and ingenuity! Read on to learn more about this year's Book Crush selections for three age groups. Open to rising 4th through 6th graders. 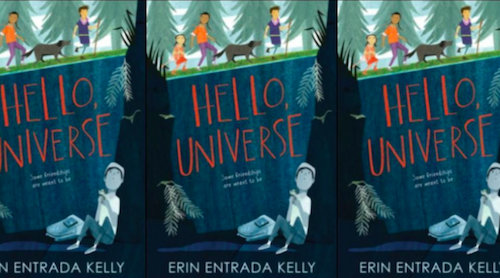 Newbery Medalist Erin Entrada Kelly’s Hello, Universe is a funny and poignant neighborhood story about unexpected friendships. Told from four intertwining points of view—two boys and two girls—the novel celebrates bravery, being different, and finding your inner bayani (hero). In one day, four lives weave together in unexpected ways. They aren’t friends, at least not until Chet pulls a prank that traps Virgil and his pet guinea pig at the bottom of a well. This disaster leads Kaori, Gen, and Valencia on an epic quest to find missing Virgil. Through luck, smarts, bravery, and a little help from the universe, a rescue is performed, a bully is put in his place, and friendship blooms. Read the reviews: The Washington Post, Kirkus Reviews, Publisher's Weekly. Check out the creative work designed, constructed, and crafted by previous Book Crushers.